Ladies and gentlemen - those few out there still reading this. This blog is coming to an end. I have enjoyed this avenue to communicate and rant and rave. But it has served its purpose and will now be retired. The other purpose of this blog was to connect with other parents of children with disability. This blog has been very useful for that purpose, and i have connected with some fantastic people, both in Australia and overseas. I have been fortunate to meet some of the people I have met through this blog - but even those i haven't physically met i consider friends. I hope you will all get in touch if you plan a visit to Australia! Wanting to connect with others in a similar situation is vital. It helps to share stories. It helps to rant and rave to those "in the know". 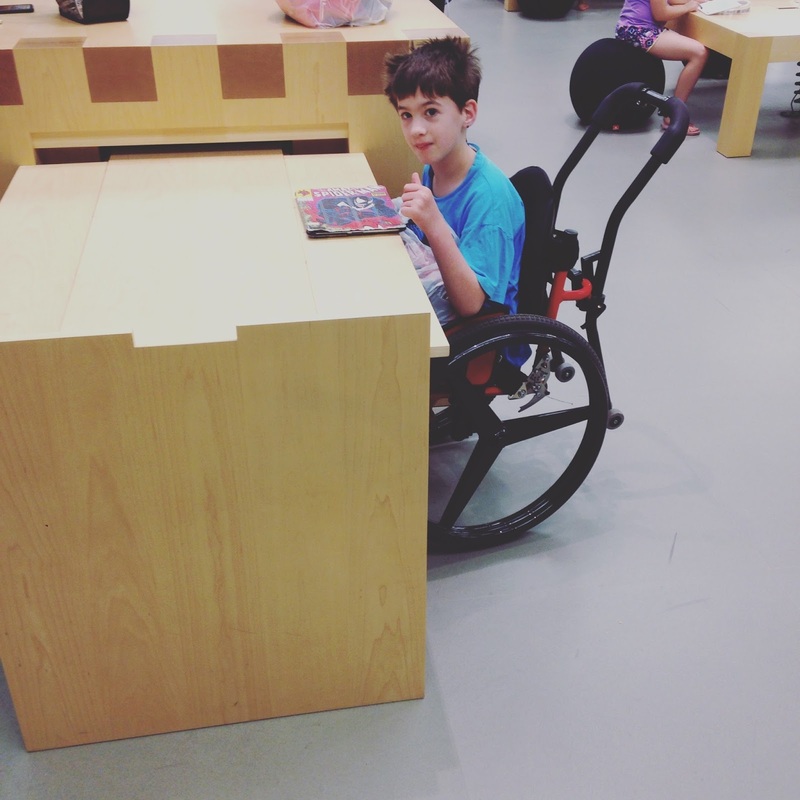 And i have learned more from other parents and PwD i have met through this blog than from any other allied health professional or service provider. But my children are now of an age where i think it is no longer appropriate that their story is out there in the world wide web. They have all reached double digits and are starting to explore the world - including the internet - on their own. This is their right, and i feel it is no longer appropriate to have my blog running possible interference. But most importantly, as the cliche goes, life is a journey. As is parenting. Parenting a child with disability is one hell of a journey, where you get thrown in at the deep end and its sink or swim. It is wonderful to be able to reach out to others. But i have been on the journal long enough now to know my way. Any issues i have to share are not really anymore about the kids. You probably noticed that in recent posts. I still have plenty to say. But its not about parenting anymore, it is more political. And thus, this blog will close down. I have started a new project. It's called Disability Discrimination Australia. Feel free to join me there. Like everyone else, I’ve been reading about Paris. There is an avalanche of comment and analysis in the media. Every angle under the sun is aired. How it’s all the Muslims fault. The Jews. It’s all the Christians fault, the Flying Spaghetti Monster – whatever, all of it nonsense. There is a lot argy bargy – and I don’t want to go into any of that here (suffice to say I think it has bugger all to do with religion and everything with power, politics and alienation, but none of that is the point here). There is this one thing really, really bugs me. Like everyone else, I read the stories of what happened. Like everyone else, I read the harrowing accounts by those young people in the Bataclan, those lucky enough to survive and give us eye-witness accounts. Like everyone else, I have seen the newspaper articles listing the dead and recounting their lives, how they were loved, cherished young people who were having well deserved fun night out so cruelly cut in a short few senseless violent moments. Yet something is missing, and my unease about it is growing. Surely I can’t the only one who is noticing the missing people? I read and read, and read some more. I do google searches. I can't find the wheelies. They are being killed twice. You see, eye-witnesses describe how the terrorists walked into the Bataclan and calmly started shooting. Their first victims were a group of wheelchair users who were at the concert. Being blunt, I guess from a tactical point of view that makes sense. If you want to kill as many people as possible, these guys are literally easy targets. There may be deeper psychological reasons too – less valued and therefore first to kill, or more valued and to be spared suffering or some warped thinking, I don’t know, and at the end of the day I really don’t care. These criminals have disgusting minds I am not overly interested in exploring. Fact is, the first victims were the disabled. Fact is also, there is a thunderous silence about this in the media. We read about the young just married couple. The nice guy who sold the band’s merchandise and died in a friend’s arms. The promising young lawyer. There is no doubt this is beyond horrifying and I have indeed stopped reading it because I just cant take that much sadness at the moment. But at least their lives were acknowledged. What about the wheelchair users? Where are they? Who were they? I cannot find their stories in the media. Do we not need to acknowledge their lives? Their deaths? They too were young people out on a well deserved night of fun. They too were loved and cherished and are mourned and missed. By not mentioning them, it’s like they have been killed twice. The media does not seem to find their lives worth mentioning, worth listing. The disabled in this story have been ignored, discarded, forgotten. Airbrushed out of existence. Both deliberately by the terrorists, and probably not deliberately by the media, who has cast their lives and stories aside as unworthy, uninteresting. I am not expecting much from terrorists. Guess it was silly of me to expect more from the media. Recently, the parking situation changed outside BooBoo's school. It was done in response to, well, stupid lazy parents parking where they shouldn't (like in front of people's driveways) because they are too lazy to walk a few extra steps. The changes they made were sensible. But they were also impossible for me. After some weeks of grumbling about it, I sent an email to my council and explained the situation. And look what happened. "In 2010 the Australian National Disability Strategy set out a 10 year national plan for implementing the obligations under the CRPD and improving life for Australians with disability, their families and carers. These commitments have driven a reform agenda designed to create a shift in attitudes across governments and communities to move beyond charity and take a rights-based response to the diverse needs of people with disability in accessing all aspects of society. In a nutshell, it means that all levels of government are legally obliged to report on the progress they have made including people with disability. So, if you have an access issue, write to your Council. State, in detail, what your issue is. 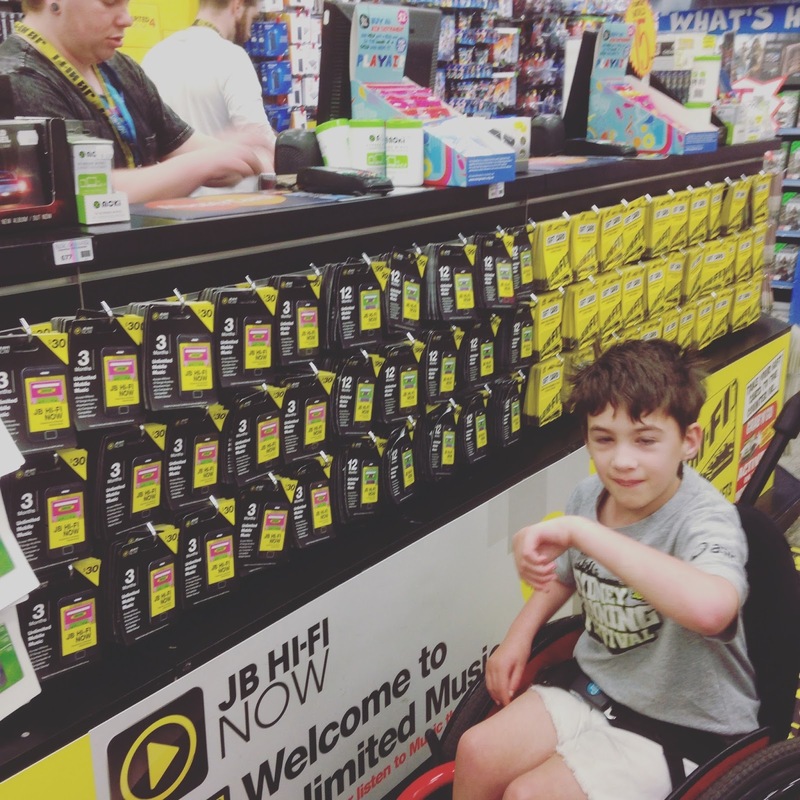 If it's appropriate, you can quote the Disability Discrimination Act 1992 (Cth). Then, if you are in NSW, remind Council of their legal obligations under the Disability Inclusion Act 2014 (NSW) and suggest again, in detail, how council can fix your access issue. You have just done your Council a favour. They must report on what they have done. You have presented them with an inclusion problem and a subsequent fix. All they have to do now is carry it out and hey presto, they have something to write about in their report. As you are aware the parking conditions have changed in F Street around KP School. There is now “No Parking” in the lower section of F Street on the left, while the right side has been designated “No Stopping”. This measure is obviously intended to increase safety for our children, and I highly commend Council for implementing this change. It does, however, put me at a considerate disadvantage. I am the mother of a child with a physical disability who attends KP School. As you can appreciate, parking around the school is difficult at drop off and pick up times. 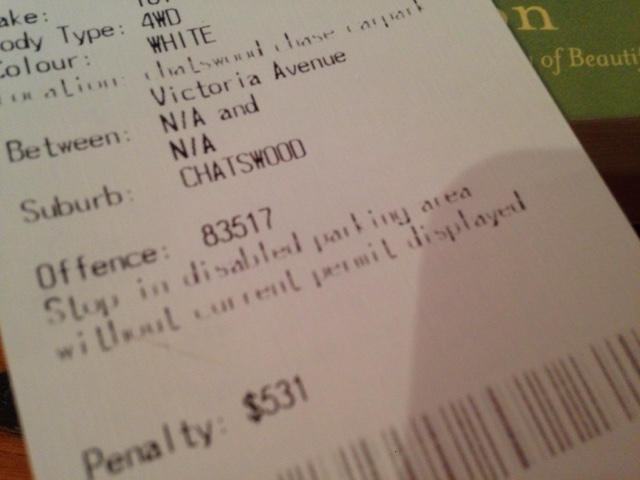 Other parents can use the No Parking zone and let their children walk to school. My daughter cannot do that, since she does not have the muscle strength to push her wheelchair that far without risking serious injury. This means I have to push her wheelchair to her classroom, which in turn means that, as the Mobility Parking rules stand, I cannot, unlike other parents, use the bottom of F Street. C Street does not have a footpath for us to use, and while the first part of F Street does have a footpath, there is no cut in the curb for us to come down and cross C Street, to then go on the (accessible) footpath at the bottom of F Street. As things stand now, I need to park in the top of F Street or C Street and push my daughter in her wheelchair in the middle of the road. Both F and C Street have high curbs, which make taking my child in and out of the car extremely dangerous. This morning I nearly fell on the high curb in C Street while carrying her from her car seat to her wheelchair. I could have seriously injured us both. As it happens, I “just” twisted my back. Nor can I safely take my daughter to R Avenue because, firstly, it is significantly busier, and secondly, there is no footpath to the front entrance of the school (although Council has kindly brought forward the timing of its construction, it does not solve my current problem). 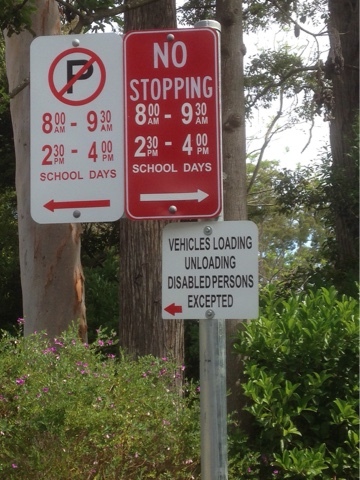 While implemented with the best of intentions, the current provision of No Parking and No Stopping around the school without an accompanying provision of a designated disability parking space has the unintended consequence of indirectly discriminating against people with disability. There is a disabled parking space in the school grounds, but I refuse to use it on safety grounds. The spot is located in the middle of the school playground, right next to the play equipment, and I would have to drive (and later reverse!) out of this spot in the middle of dozens of young children. In addition, it requires opening and closing (on the way in and the way out) a gate, which makes this spot not only unsafe to use but impractical for anyone with mobility issues. Could I respectfully request Council to provide a disabled parking spot (in a location of your choosing) outside KP School. Such a dedicated parking would go a long way to solve access difficulties for me (and the wheelchair using parent of one of the kids in the school), would impact less on the neighbours of the school (as it is used by a limited number of people with permits) and would be a credit to fulfilling Council’s requirements under the Ku-ring-gai Access and Disability Inclusion Plan (2014-2018). People are sometimes surprised to hear the way parents and people with disability talk about service providers. Overall, we are not impressed. But they do such great work. Yes, yes. And there are some top individuals working there, who are good at their jobs and work with the right motivation. There is no doubt about that. But nevertheless, we are not impressed. Today I got the phone all we have been waiting for. The new wheelchair is finally ready! Hurray. 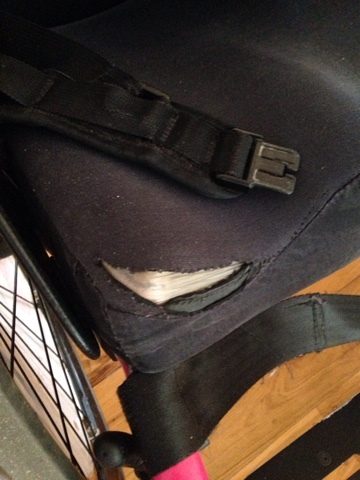 The current one is falling apart and too small, resulting in daily back pain. The new one took about a year to arrive and now it's finally here. Siince it's a government funded wheelchair, the occupational therapist (OT) of my service provider needs to sign for delivery. I get that. The OT, who is very capable and lovely, works part time. I get that. Her diary is full up for the next three weeks. First available appointment with her is in 4 weeks. I get that. So, we are supposed to wait another 4 weeks to receive a chair, which is ready. Which is badly needed. Which would help a great deal towards alleviating daily pain. My service provider is one of the biggest and oldest in NSW. They know my kiddo. They know the issues. They have her backache on file. And they want to let a 9 year old kid in daily back pain wait three weeks to receive her new wheelchair because the OT's diary is full. Ask another OT to receive the chair and sign off on it maybe? Nope. See why I'm not impressed? Their systems and procedures might work for the organisation's management. They just don't work for the clients. Now thankfully the folks at Mogo Wheelchairs who made her chair do have working brains and hearts. I am picking the chair up on Wednesday. Their guy, a qualified OT, will make any needed last minute adjustments. We can then take the chair home while waiting for an appointment to get the OT to officially receive and sign off the chair. I received a letter today which left me (momentarily) speechless - and then livid! In June 2014, our service provider put in a request for a new manual wheelchair for BooBoo with EnableNSW. This is kinda important, as a manual wheelchair is her main means of getting around. In the past we have bought her chairs ourselves because, well, dealing with EnableNSW is not my favourite pastime. And we've had the means, so I don't want to take funding away for those who need it more. As things stand with hubby's business, we cant currently fund another wheelchair. We have spent lots of money on home modifications and equipment (4 wheelchairs, 3 walking frames and one standing frame - and those are just the big items) and we haven't really got an income at the moment. So while there is no doubt BooBoo needs a new chair, I have no option but to request it through EnableNSW. The chair she currently has was not the best fit from day one. Let's just say her needs and abilities were not interpreted adequately by the service provider (whose expertise lies with clients with quite different needs, but the disability system being what it is, this is our designated service provider). We adapted the chair where we could. We did some creative re-modelling to make it work. But it meant the chair reached its maximum growth capacity within a year of its arrival, and I knew a new one was needed soon - despite BooBoo's thankfully relatively slow growth. I knew it would take time, so the OT and I prepared the application in good time. I was also assured that this was a priority two item for her (being her main mobility) and should come relatively quickly. It was approved without too much difficulty Now funds have to be released to the supplier to commence making the chair. In January, BooBoo started complaining about a sore back. Every day. We are lucky a kind Paralympian (you know who you are Rosemary) made some further changes that have alleviated the back ache somewhat. Our new OT requested EnableNSW to please speed up funding for the chair due to BooBooo's daily back pain. I was told they have two weeks to respond to this request. And at the end of those two weeks, today, I received this letter. It tells me nothing whatsoever about wether her chair will be funded sooner and if so, when. Instead it insults me telling me I need to have patience because others have equally pressing needs. As if I don't effing know that?!?? 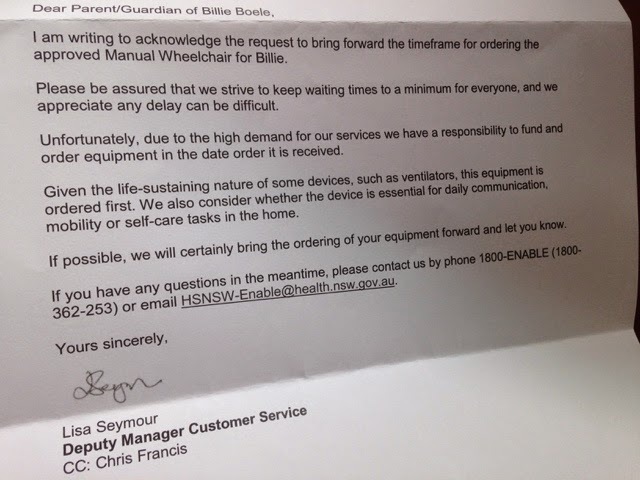 The letter even implies that my impatience is unfair towards people waiting for a ventilator. As if I ever would dare to suggest a ventilator would not be more urgent than a wheelchair. 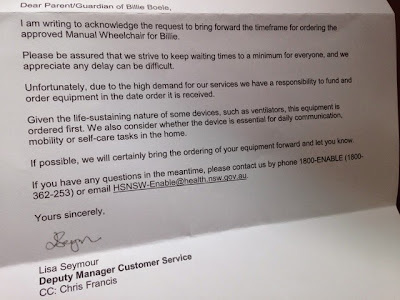 In fact, as a priority one item, surely EnableNSW isn't seriously suggesting people have to WAIT for a ventilator do they?! I was seriously incensed by the letter and rang them straight away to complain about the tone of it. I have since followed up with a written response which requests and actual answer as to when I can expect the chair to be funded and twister my disgust with the tone of the letter. Because really, I enjoy nothing more than battling bureaucracy (and getting insulted in the process). Sigh.